Buy BarleyCup Powder - Instant Cereal Drink 200g in the UK from our online shop or directly from our independent Scottish store. Barleycup is easy to make and has a mild taste the whole family will love! Gluten free and Certified by Coeliac UK. Barleycup is a caffeine free, instant cereal drink made from roasted barley, rye and chicory. We sell real Barleycup and other Coffee Substitutes directly from our shop in Scotland and online throughout the UK. View more products from Barleycup. Where can you buy real Barleycup Powder safely online? If you are wondering where you can buy BarleyCup Powder - Instant Cereal Drink 200g safely online in the UK, then shop with us. 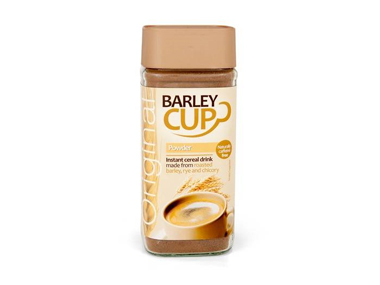 Barleycup Powder - BarleyCup Powder - Instant Cereal Drink 200g in Coffee Substitutes and Drinks.